Tell Sony how to Make the PS3 Better! Is there something you don't like about the PS3 (other than that it doesn't have Mass Effect 2)? Sony's new PlayStation.Blog Share service is an official way for you to let them know what they can be doing better. It's a problem that any reasonably popular content provider has: You can be making a post about some cool new feature you're excited about offering and talking over with the community, when some grump comes in to the thread with an off-topic complaint: "Hey guys, when are you going to nerf Rogue damage, huh??" That isn't to say that their claims are always invalid, just that they aren't being said in the right place - but another problem is that most of the time, there is no right place other than a faceless-seeming email account. That's the problem that Sony is attempting to solve with its new PlayStation.Blog Share feature. Do you have a cool new suggestion for something Sony could add to the service, or a complaint about something you don't like? Post it to the Share, and if people like it it'll get bumped to the top - where Sony can hopefully see it as an issue worth addressing. It's a very cool new feature. Every company has a "email us suggestions!" inbox somewhere or other, but what's nice about the PS3 Share is how public it is - and how you can check to see what the community thinks is its most pressing concerns. I also like how you get rewarded through visibility if you vote on multiple subjects, so that encourages people to sift through them instead of just finding the most popular. 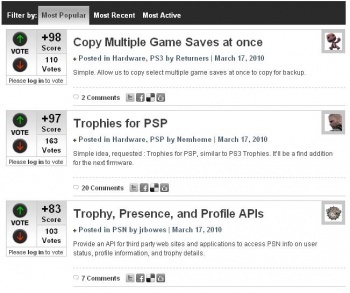 At the moment, the three most popular topics are: "Copy Multiple Game Saves at once," "Trophies for PSP," and "Trophy, Presence, and Profile APIs." Obviously coding takes a long time, so these won't happen within the week or maybe within the month, but hopefully this service will put these things on Sony's radar. Good job with this one, guys!